Our mission is to provide the highest quality custom pools and spas, matched by the highest level of customer care. Your complete satisfaction beginning from your first consultation, through completion of the project, is our number one goal. VistaPro Pools & Spas specialize in providing custom pools and spas that will increase the value of your property and enrich your quality of life. We transform ordinary exterior areas into breathtaking outdoor living spaces. Our comprehensive array of services encompasses all phases of design and installation, as well as full service maintenance. As you prepare for pool ownership, we want to help you make sure you have all your questions answered. As your premier pool designer and builder, we’re here to help you understand the entire process, how to care for your pool and what to expect once it’s complete. We strive to surpass the expectations of every client. 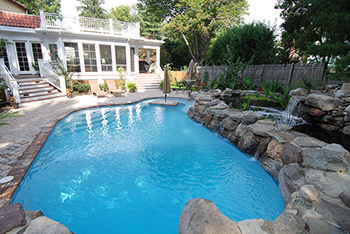 For decades, VistaPro Pools & Spas has been Maryland’s most innovative Swimming Pool Builder and Spa Construction Company in the tri-state area; continually chosen as Washington D.C.’s Swimming Pool and Spa Contractor of Choice. VistaPro stays ahead of the competition from our state-of-the-art facilities and materials, to our pioneering approach and commitment to designing and building even the most challenging of projects. The success and legacy of VistaPro relies on our guarantee of superior customer service. We strongly believe our clients are best served through open lines of communication. Our team of professionals provides each client with a clear expectation of what you can expect throughout the entire process. Always welcoming your questions and feedback, we aim to surpass your greatest expectations. VistaPro Pools & Spas utilizes the latest state-of-the-art swimming pool construction materials, techniques and equipment. We also back up our work with the most comprehensive warranty in the swimming pool construction industry. VistaPro offers a full-spectrum contracting and design service for homeowners, contractors and developers. Our staff is comprised of the most knowledgeable and seasoned professionals in the industry. We take pride in our ambitious and progressive team of innovative pool and spa designers, engineers and build teams – and you will too! Visit our Maryland showroom to see our comprehensive product and material displays, where you can choose the perfect materials and design for your project. Let us show you how VistaPro Pools & Spas can help you realize your backyard swimming pool and spa dream oasis. Browse our online showroom for ideas, and see the quality design and craftsmanship we put into every custom swimming pool and spa that we build. A custom swimming pool or spa addition to your backyard can add value to your home, while creating that tranquil backyard environment you and your family will enjoy for years to come. Our outstanding swimming pool and spa design team will work with you every step of the way to ensure you get the swimming pool and spa you have always dreamed of. VistaPro will design and build a custom swimming pool and spa to match the concept you have in mind. You imagine it and we will design and build it, because there are no limitations to what can be created for that lifetime of backyard enjoyment and fun! Click on the portfolio tab above to view photos and examples of VistaPro’s outstanding swimming pool and spa designs and craftsmanship. Contact us today for a free estimate and our professional team will be ready to assist you.